The voters vowed to take their revenge at the polls. They’d missed out on the country’s vaunted prosperity. They were disgusted with the liberal direction of the previous administration. They were anti-abortion and pro-religion. They were suspicious of immigrants, haughty intellectuals, and intrusive international institutions. And they very much wanted to make their nation great again. They’d lost a lot of elections. But this time, they won. In two elections last year, the conservative Law and Justice Party (PiS) won the Polish presidency and then, by a more convincing margin, a parliamentary majority. And this wasn’t just a victory for PiS. It was a victory for Poland B. Since its post-Communist transition, that country is often described as having cleaved into two parts, commonly known as “Poland A” and “Poland B.” Poland A links together an archipelago of cities and their younger, wealthier inhabitants. Poland B encompasses the poorer, older parts of the population, many clustered in the countryside, particularly in the country’s eastern reaches near the former Soviet border. After 1989 and the implementation of a punishing series of economic reforms, Poland A took off economically. By 2010, Warsaw, the capital, had become one of the most expensive places to live in Europe, outranking even Brussels and Berlin. New entrepreneurs and corporate managers took advantage of a host of economic opportunities, particularly after Poland joined the European Union (EU) in 2004. In the countryside, on the other hand, Poland B fell ever further behind. Factories closed, and many farms couldn’t keep going. Jobs disappeared. Several million Poles decamped abroad in search of better economic opportunities. In other words, as the good times rolled in Poland A, Poland B languished. Until the elections of 2015, Poland’s liberals dominated political, economic, and cultural life. Although they may not exactly be “liberal” in the American sense of supporting government entitlement programs, they are generally less religious, more tolerant of differences, and more open to the world than their conservative counterparts. They have squared off against the denizens of Poland B over such issues as the role of the Catholic Church in public life, the number of immigrants the country should allow in, and how close Poland should be to the EU. You can find the equivalent of Poland A and Poland B elsewhere in Eastern Europe, too. The capitals of the region — Prague, Bratislava, Budapest — enjoy per capita GDPs well above the European average, while rural areas suffer. The B populations, however, have not taken their increasingly second-class citizenship quietly. Throughout the region they’ve risen up to vote for populist, often rabid, right-wing parties like FIDESZ and Jobbik in Hungary and GERB and Ataka in Bulgaria that voice their disappointment and swear they’ll make their countries great again. These parties are consistently anti-liberal in the European sense, opposing both an unregulated market and tolerant open societies. No doubt it’s occurred to you by now that the United States is not immune to this trend. With the rise of an aggressive version of right-wing American populism, the United States is waking up to a dividing line that is becoming sharper by the day. Donald Trump has made headlines with his talk of building a wall between the United States and Mexico, but his campaign has highlighted a more important division: between America A and America B. Responding to the irresistible pull of celebrity culture and to the exclusion of almost anything else, the U.S. media has focused on the person of Donald Trump. Far more important, however, are the people who support him. That rousing speech put Obama on the map. But that map would have its revenge. Once he reached the Oval Office four years later, the representatives of the Republican red states would ceaselessly battle the president’s every initiative from health care to the Iran nuclear deal. As a result, during his tenure, the U.S. became more, not less, politically divided. In some sense, though, the Obama of 2004 was right. The key dividing line in the U.S. had little to do with Republican vs. Democrat, rich vs. poor, or liberal vs. conservative. To explode these conventional oppositions, it would take a billionaire Republican populist, who had once been a solid Democrat and who offered a political program that mixed together liberal and conservative ideas, conspiracy theories and racial animus, but above all else exhortations to America B to rise up and retake the country. Indeed, the triumph of Trump in the Republican primaries — based, in part, on his appeal to former white working class Democrats and independents, his fierce attacks on mainstream Republicans, and his flouting of what passes for conventional wisdom about electability — sent the pundits back to their think tanks to figure out what on earth was happening with American voters. Trump was, they concluded, sui generis, a peculiar mutation of the American political system generated by the unholy coupling of reality television and the Tea Party revolt. But Trump is not, in fact, a sport of nature. He reflects trends taking place around the world. He is, in many ways, just a mouthpiece for America B.
It’s been notoriously difficult to characterize the Trump constituency. It’s much easier to identify the people who will never vote for him: Latinos angered by his racist taunts about Mexican immigrants and a federal judge, women outraged by his sexual innuendo and misogyny, and virtually everyone with an advanced degree. Writing off these constituencies — particularly women, since they constituted 53% of the electorate in 2012 — should doom Trump’s presidential bid. Yet Trump is proving to be a guilty pleasure for many voters, like binge-watching a TV show about a serial killer or eating an entire quart of artery-clogging premium ice cream. The urge to vote for him is something that some Americans will never admit to outside the curtained privacy of the voting booth. But he scratches an itch. He’s the electoral equivalent of a day at the firing range, a way of blowing off political steam. Trump voters tend to be overwhelmingly white, middle-aged, lower-income men whose education stopped at high school. They are not stupid, nor are they, as Thomas Frank argued about working-class Republican voters in his astute book What’s the Matter with Kansas?, voting against their own economic interests. Trump may be a billionaire, but he has articulated an economic policy that diverges from the naked plutocracy of the party of Mitt Romney. He has opposed trade deals that outsource American jobs, supported higher taxes for “hedge-fund managers,” and declared his commitment to saving Social Security, Medicare, and Medicaid. Yes, of course, Trump has also made statements directly contradicting these positions or aligned himself with politicos who take the exact opposite stances. But the billionaire has constructed an image of himself as a triumphant version of an “average Joe” (with billions in pocket change) that plays well in America B. Whether consciously or not, he has taken a page from the Europe B playbook by combining positions skeptical of the unrestrained free market with a lot of nationalist bluster. It bears a family resemblance to fascism, but the American variant is firmly anchored in the kind of individual initiative celebrated on The Apprentice. What also sets Trump apart is his commitment to making “America great again.” His opponents have tried to argue that America is already great, has been great, and will always be great. But the truth is, for many Americans, things have not been so great for at least the last two decades. This line, more than Trump’s intemperate rants and off-the-cuff insults, is what ultimately distinguishes America A from America B. At a time when the American economy is growing at a respectable pace and the unemployment rate is below 5% for the first time since 2008, America B has not benefitted from the prosperity. It has suffered, not profited, from the great transformation the country has gone through since 1989 (and was particularly hard hit by the near economic meltdown of 2007-2008). After all, it wasn’t just the former Communist world that experienced a transition at the end of the twentieth century. In the 1990s, the United States changed its political economy. It was not quite as dramatic a shift as the regime changes that took place across Eurasia, but it had profound consequences for the realignment of voting patterns in America. During that decade, the U.S. economy accelerated its shift from manufacturing — along with the well-paying blue-collar jobs that sector had once generated — to an ever more dominant service economy. In terms of employment, manufacturing jobs dropped from 18 million in 1990 to 12 million in 2014, while wages for such jobs tumbled as well. Over that same period, the health-care and social assistance sector alone grew from 9.1 million to more than 18 million jobs. At one end of that service economy were the 1% in financial services making stratospheric sums, particularly as compensation packages soared from the mid-1990s on. On the other end were the people who had to add shifts at McDonald’s or Walmart to their full-time jobs or monetize their spare time by driving for Uber just to make what they or their parents once earned with one job at the local factory. America was not alone in undergoing this shift. Thanks to technological innovations like computers and robotics, greater access to cheap labor in places like Mexico and China, the rise of the Internet, and the deregulation of the financial world, the global economy was being similarly transformed. Blue-collar workers no longer played as vital a role in any advanced economy. In the U.S., put bluntly, the imagination of America A no longer needed the muscle of America B. At one time in its history, government programs narrowed the gap between economic winners and losers through taxes and the entitlement programs they supported. But “small government” fever — which had remarkably little to do with actually reducing the size of government — swept the United States in the 1980s, first in the Republican Party of Ronald Reagan and then in the “reinvent government” faction of the Democratic Party. In the 1990s, they would collaborate across the aisle to slash assistance to low-income people. The resulting political (and economic) realignment created some notorious ironies, including the fact that Richard Nixon, with his wage-and-price controls and environmental policies, was a far more liberal president in the early 1970s than the Democratic Party standard bearer of the 1990s, Bill Clinton. Because of this realignment, an entire group of Americans no longer could count on support from either the Republican or the Democratic Party. They lost good jobs during the economic expansion of the Clinton years, and did not benefit significantly from the tax cuts of the George W. Bush era. Instead, by the Obama years, they were working longer hours and taking home less money. In the meantime, a new liberal-conservative consensus was emerging. Both yuppie liberals and 1% conservatives, at odds over so many political and cultural matters, had agreed to abandon America B. Falling behind economically and feeling betrayed by politicians on both sides of the aisle, America B might have moved to the left if the United States had a strong socialist tradition. In the 2016 primary campaign, many of the economically anxious did, in fact, support Bernie Sanders, particularly the younger offspring of America A fearful of being deported to America B. Unlike Europe B, however, America B has always been more about rugged individualism than class solidarity. Its denizens would rather buy a lottery ticket and pray for a big payout than rely on a handout from Washington (Medicare and Social Security aside). Donald Trump, politically speaking, is their Powerball ticket. Above all, the inhabitants of America B are angry. They’re disgusted with politics as usual in Washington and the hypocritical, sanctimonious political elite that goes with it. They’re incensed by how the wealthy have effectively seceded from American society with their gated estates and offshore accounts. And they’ve focused their resentment on those they see as having taken their jobs: immigrants, people of color, women. They’re so desperate for someone who “tells it like it is” that they’ll look the other way when it comes to Donald Trump’s inextricable links to the very elite who did so much to widen the gap between the two Americas in the first place. As the Democratic Party emerges from a bruising primary, it is trying to emphasize both the importance of unity and the urgency of the upcoming elections. Indeed, pundits are calling 2016 “perhaps the most important presidential vote in our lifetime” (Bill O’Reilly) and “one of the most pivotal moments of our time” (Sean Wilentz). But if Poland is any indication, the presidential election this year will not be the critical one. Although Donald Trump may speak for America B, he is a weak candidate. His negatives are high, he has an unenviable record to run on, and his tendency to shoot from the hip will eventually cause innumerable self-inflicted wounds. Even if he does manage to win in November, he’ll still face a divided Republican Party, an unremittingly hostile Democratic Party, and a political-economic elite inside the Beltway and on Wall Street who will push back against his unworkable and unpalatable proposals. That’s the situation that the Law and Justice Party faced in 2005 in Poland, when it first managed to squeak into power. The Polish parliament was divided and was not able to implement the party’s populist agenda. Two years later, the liberal opposition returned to power, where it remained for eight more years. But when PiS won again last year, conditions had changed. It finally had a comfortable parliamentary majority with which to power through its Tea-Party-like transformation of Poland. Moreover, it was riding high on a Euroskeptic, anti-immigrant wave that had practically inundated the continent. America B has a fondness for Donald Trump and his almost childlike audacity. (Gosh, kids say the darndest things!) Right now, his fans are attached to an individual, rather than a platform or a party. Many of his supporters don’t even care whether Trump means what he says or not. If he loses, he will fade away and leave nothing behind, politically speaking. The real change will come when a more sophisticated politician, with an authentic political machine, sets out to woo America B. Perhaps the Democratic Party will decide to return to its more populist, mid-century roots. Perhaps the Republican Party will abandon its commitment to entitlement programs for the 1%. More likely, a much more ominous political force will emerge from the shadows. If and when that new, neo-fascist party fields its charismatic presidential candidate, that will be the most important election of our lives. As long as America B is left in the lurch by what passes for modernity, it will inevitably try to pull the entire country back to some imagined golden age of the past before all those “others” hijacked the red, white, and blue. Donald Trump has hitched his presidential wagon to America B. The real nightmare, however, is likely to emerge in 2020 or thereafter, if a far more capable politician who embraces similar retrograde positions rides America B into Washington. Then it will matter little how much both liberals and conservatives rail against “stupid” and “crazy” voters. Nor will they have Donald Trump to kick around any more. In the end, they will have no one to blame but themselves. John Feffer is the director of Foreign Policy In Focus at the Institute for Policy Studies. His dystopian novel, Splinterlands, a Dispatch Books original (with Haymarket Books), will appear this fall. He is a TomDispatch regular. Follow TomDispatch on Twitter and join us on Facebook. 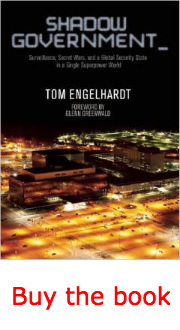 Check out the newest Dispatch Book, Nick Turse’s Next Time They’ll Come to Count the Dead, and Tom Engelhardt’s latest book, Shadow Government: Surveillance, Secret Wars, and a Global Security State in a Single-Superpower World.